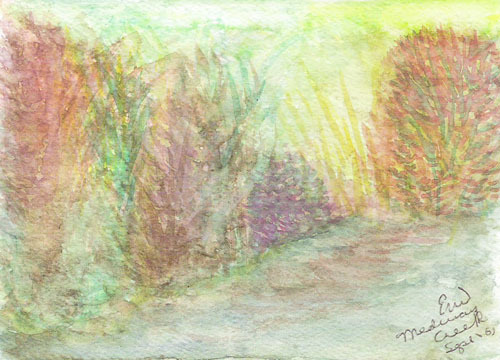 Watercolours happened "by accident" for me about 18 years ago. I used to run my dog along the Thames River near Vauxhill Park. Always a keen observer of nature, I began to admire the plethora of wild flowers. I started gathering and identifying. The vast number of different species was overwhelming. The range of their amazing shades really attracted me, so I started pencil sketching them. Then I attempted watercolours. I began giving away small note cards, all originals. They usually focused on one or more wildflower scenes of vibrant colour from nature. I soon realized that this was a wonderful outlet for my creativity.